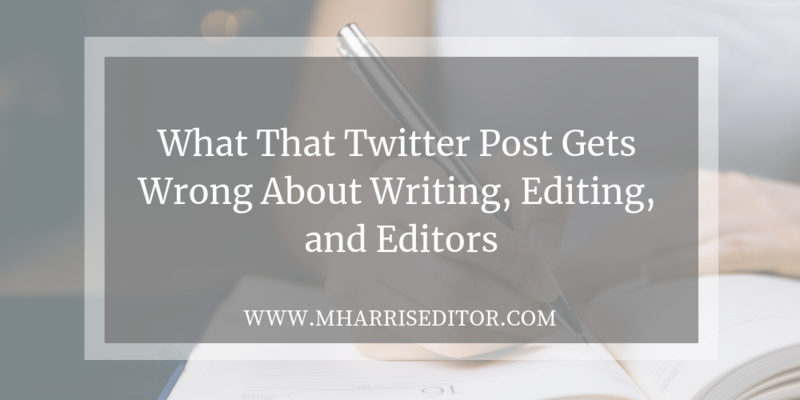 A recent Twitter post from a freelance editor has been getting a lot of eyeballs and riling up editors, as is to be expected. While I won’t use the person’s name for fear giving her a platform just amplifies her brand and values I don’t agree with, I did want to address each of the points in her message. What’s wrong with these assertions? Not only is the above downright laughable, but it’s unachievable to the majority of writers. Her points scream privilege and serve as a reminder to me that writing is often seen as a pay-to-play market, leaving out specific underrepresented socioeconomic groups. Moreover, the condescending use of “broke” to describe writers relative to the idea of privilege makes me wonder what message she is actually trying to share. Is she trying to imply the writers aren’t actually cash strapped, but are instead keeping themselves from prioritizing paying for services over other needs? Are they “broke” in her eyes because, God forbid, they are real people with real problems who are worried the investment may not pay off in the end? Here is a point-by-point breakdown of why three of the above ways to pay for an editor are not recommended or ideal, and the fourth is doable but comes with caveats. Unless you are well connected or have some obscure rich uncle who “believes” in your work and can bankroll your service, this is unattainable. I have a feeling most writers do not fall into this category, and most wealthy people may not see the investment worth it to them from an ROI perspective. For one, they don’t get anything out of the deal other than to feel good for funding your book. I have a feeling most investors would rather put their money into stocks, bonds, etc. instead of paying for your edits. Also, there is no such thing as a free lunch, so even if they are bankrolling your project, they may want something in return. What might that mean? That could vary, but in reality, the chances of you finding someone to front your project so you can pay for edits is very unlikely. This is a terrible, horrible idea that no one should attempt to do. If you want to pay for an editor or need to revise your draft for free, there are so many other ways to go about doing it (at the end of this post). For one thing, you could try saving up your money to pay, or negotiate with your editor to pay as they go (example: pay for chapter blocks as you can afford it). Simply taking out a loan may not work for most people because their credit could be poor, or they may have no credit. Additionally, it just doesn’t make good fiscal sense. I don’t consider myself a money expert, but there are better uses for loans and credit. This is not one of them. If you are really in need of an editor and are considering a loan, find a writer’s group, learn to write better, find critique partners – do ANYTHING but take out a loan to pay for this! As an editor, reading this specific piece of advice just turns my stomach. I do not want anyone to go into debt to pay for my services. Likewise, I’m torn because I’m running a business and businesses require profits to be successful. However, it would be unethical for me to suggest someone take on debt to fund my business. If that is something any prospective client of mine is entertaining, then we aren’t a good fit and I’d much rather they avoid debt for my sake and their own. If you’re working with other writers who are pretty solid at editing others, you might offer to trade critiques or beta reading for edits, effectively allowing each of you to improve your work and have other readers go through the manuscript you have put together and need revised. However, I would venture to say the majority of editors, who only provide editing and may not be looking for other services, would rather get paid for their work and use that compensation to pay for their business expenses, help support their family, pay for groceries, etc. It won’t hurt to ask an editor if they are open to this, but don’t expect them to say yes. The editor has to see what you are offering as equal to the service they are providing, so be cautious using this as a way to “pay” for your work. It’s also not a good idea to make a habit of trading services if you can’t commit to providing something of equal value to that other person. If you are able to make the arrangement work, great! If not, you may be better off saving to have edits done or finding ways to self-edit successfully. This is the one recommendation I can get on board with, BUT also understand that if you do this, you commit to paying the editor for their services over the course of a few months. Missing payments or paying late may come with fees, which means you would pay more than you had budgeted for the edit. Also, because editing is not a guarantee of your book’s success, you have to be able to pay them back regardless of performance. If you’re comfortable with this possibility, then discuss a payment plan, but be realistic. Set expectations to pay a set amount with the editor and remain professional. If you treat the payment plan like you would for any other service you’re paying for over time, then this might be a good option for you. Self-edit – While not always easy for beginning writers, do your best to clean up the most obvious errors. Chances are there are some noticeable mistakes you didn’t even realize you had! And don’t beat yourself up for these issues; you’re only human, and you’re learning to improve. Find a critique partner – If you’re looking for help from other writers, join a writers group virtually or local to you and find a partner that can read through your book and provide objective feedback. Learn how style guides work and apply them – I enjoy looking at Strunk & White’s The Elements of Style for rudimentary help on writing, but there a number of resources out there that can help you become a better writer. Most are free, such as websites like Grammar Girl, but paid resources can be helpful, too. Use software that reads your book aloud – If you don’t have software to help read your manuscript back to you, you can always read it out loud to yourself to check for glaring issues to fix. Work with students looking to learn about fiction writing – Some graduate programs relating to publishing, marketing, and English may include undergraduate or graduate students looking to hone their skills. They may be available to provide you some help for free or a small fee. Did I miss an idea? Leave a comment and I just might show it below! Why Does Editing Matter at All? Do not let the cost of an editor detract from your desire to get your story out there. While publishing often is seen as coming with barriers to entry, you do not need an editor right away to make your story shine. Do the heavy lifting and seek outside help where you can. Use this knowledge to create your best work, and then either publish it yourself or seek out agents and publishers. Most editors are good people just trying to find a way to help others, but when controversy like this surfaces alongside chants of “Never use an editor!” it can be hard to read. I understand the reasons people don’t or can’t hire editing, but I’ve also seen it benefit others to invest in editing through my client’s own stories. It’s given writers confidence to continue doing what they love. It’s helped connect a first book in a series with a publisher who has decided to pick up that and the other six books in a seven part saga, all before most of the books were written. It’s provided hope for a story where an author had nearly given up ever seeing their vision polished to a nice sheen they were happy to share with the world. It’s motivated authors to remember why they loved writing in the first place. I’d love to help anyone who came to me for help, but I’m also running a business and don’t always have the time or ability to help for reduced prices or for free. If I can help, I will. I aim for flexibility and fairness, considering and accepting bartered services/goods in exchange for help. Not every editor has the means to do this, but I find it helps to strike a balance. If you are a writer and you truly can’t pay for editing, please don’t until you’re ready. Please avoid taking out a loan to pay a professional. Please keep away from finding an investor for your book project. But, most importantly of all, please don’t give up on us because the supposed sticker shock of a few “gotcha” posts made you reconsider the value a professional brings to the table.